On January 26, 2015 Rocky Mountain will turn 100 years old. We are going to hold a big celebration of this event two days earlier on Saturday January 24th at the Boulder Theater in Boulder, Colorado. I will be the main speaker at this event and there will also be the premier of a new film on the park called "Wilderness, Wildlife and Wonder. Park officials will be there and we will also be having an auction of some of my work. I will also be on-hand signing books after the event. It is going to be a wonderful celebration of this momentous event. I hope you can make it, as it will be a while until we celebrate the park's next centenary! Tickets can be purchased from the Boulder Theater. Come and enjoy live music, wonderful food, and beautiful art to help kick-off a year of celebration of Rocky Mountain National Park. you will experience the wonder of a night deep in the forest. opening. You’ll want to see their beautiful venue and taste from their delicious menu. • Dancing Pines Distillery will be on hand, offering samples of their spirits. I know that many of you were concerned about us following the incredible storms we had here in Colorado. We received nearly a year's worth of rain in just a couple of days. This destroyed most of the roads in and out of town and badly damaged much of the surrounding community. Our little shop surprisingly survived without any damage. The gallery is now open a few days each week. As more visitors return to Estes Park, we will increase our hours. In the meantime, we are trying to assist those who are in need. You can join us by contributing to the great work being done following the flooding by Crossroads Ministries of Estes Park or by contributing to help my friend "Igloo Ed" who lost his home in the flood. Earlier this spring I opened a new gallery called Images of the Desert in northern New Mexico. It is located at the Christ in the Desert Benedictine Monastery which is the most remote monastery in the western hemisphere. Here I have a collection of my favorite desert photographs on display. I've been working on this collection for quite a number of years but have not had a place to display these images until now. So far, the gallery has been quite successful. This monastery is well known and has become a place of retreat for many across the world. We hope that if you are ever in the area that you will take the time to visit my gallery in it's amazingly beautiful and peaceful setting. Today, we received news that we are one of the businesses with the highest ratings on Trip Advisor and so have been awarded their certificate of Excellence. We try as best as we can to make sure that we do our best for everyone who visits our gallery or places an order with us. I am something of a perfectionist and so am not content until our customers are fully satisfied. My aim is not to grow a big business but to treat people right. If you've worked with us in the past we'd love it if you left a review for us on TripAdvisor, Yelp or on Google Business Pages. Your input is always appreciated! 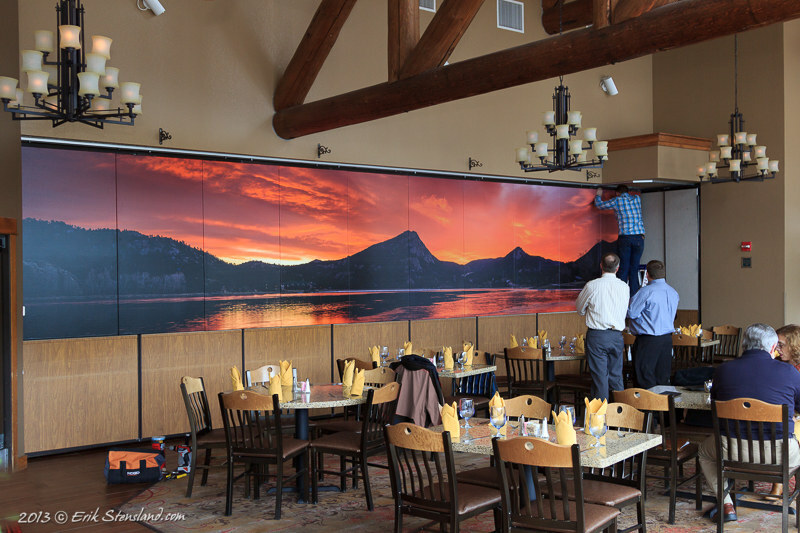 Yesterday, I installed one of my recent photos inside the Waterfront Grille Restaurant inside the Estes Park Resort on Lake Estes. This was a little larger than most of the print orders I get. They needed it to be 30 feet long by 6 feet tall. It also needed to be removable so that they can open this accordion wall each weekend. So, we did it in canvas panels that attach to the carpeted wall with Velcro. I think it came out really well. February 11, 2013: New Book Released! Almost every day people tell me that they wish they could take photos like mine but feel it is an unreachable goal, only to be accomplished with top-of-the-line, expensive equipment. In this new e-book, I provide an introduction to the world of landscape photography, making it easily understandable while also showing how you can do it on a very limited budget. 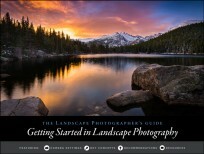 Getting Started in Landscape Photography is your guide to taking the first steps in this wonderful art. Every year I put together a collection of my favorite images from the past year. It is always a difficult task as each image brings back a flood of memories. For me, the photos are much more than simple images but rather they are reminders of experiences much like your own family photos. Nonetheless, I've paired them down to what I think are probably my favorite images from 2012. I hope you enjoy them. 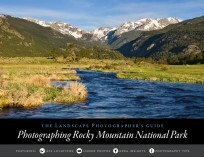 For years, people have been asking me for information about where to photograph in Rocky Mountain National Park. Well, I've finally put together a 100 page book filled with photos that shows where to go, when to be there and how to get the best shots. It is based on many years of experience and is an incredibly helpful guide for those visiting the national park. Right now, I've just released it in a PDF version which can be read on tablets and computers and soon I will also have printed copies available as well. I'll announce it here when they are ready. Click on the image to read more about it or to order the PDF version. 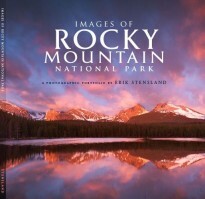 After several years Skyline Press has finally re-released "Images of Rocky Mountain National Park" a paperback book featuring some of my older images of Rocky. They've put a beautiful new cover on it and included one or two new images. You can order it directly from the website or pick it up at most Colorado bookstores including those within Rocky Mountain National Park. At the end of each year I like to sit down and sort through the hundreds of photos I've taken throughout the year to find the ones I like the most. This is a very subjective process and a lot of it has to do with my personal experience while taking the photos. So, my choices may be very different from what you would choose. I would also guess that in a year or two I will have a completely different opinion about these and put together a very different list. Anyway, I've chosen 11 images to represent my work for the year 2011. Have a look and let me know which ones are your favorites. At the end of October 2011 I made my yearly autumn trip. The purpose of these trips is primarily to give me a chance to unwind and enjoy some days of solitude after a busy summer season. I typically head to the desert southwest which I really enjoy but on my last trips I ran into so many people who knew me that I decided I needed to go somewhere that I could just be anonymous. I figured it would be cold and rainy in the Pacific Northwest so that is where I went. I spent a week traveling through Olympic National Park in Washington and the Columbia River Gorge in Oregon. It was an amazing trip and the weather was anything but rainy for most of my visit. I came home refreshed and with a lot of photos. If you're interested click on the photo to have a look. In early May I managed to run away for a week to enjoy my yearly spring trip to the desert. This is where I unwind after months of being trapped in the gallery and begin to prepare myself mentally for the busy photographic season which lies ahead. It is always so much fun to run away from winter for a little bit and get an early taste of spring. On this trip I alternated from visiting heavily traveled spots to more remote locations. Have a look at some of what I saw.